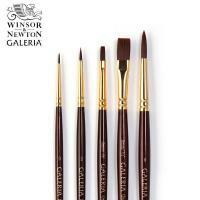 Galeria brushes have been specifically designed for use with acrylic colour. 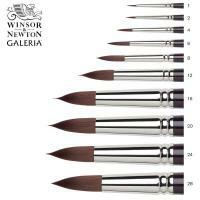 The versatility of acrylic colour places heavy demands on any brush which is why Winsor & Newton created Galeria brushes to be strong and resilient, whilst offering flexibility and sensitivity in use. The unique mix of synthetic filaments has been developed to provide artists with perfect control for thicker application of colour and responsiveness, whilst maintaining excellent shape retention. The versatility of the range means it is available in both short and long-handle variants. 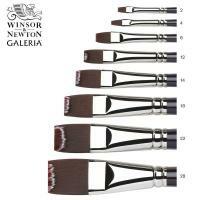 The short-handles have a softer head, ideal for using when a thinner consistency is required for glazing or a water colour style of painting. 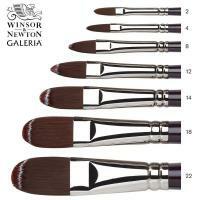 The long-handled brushes are made from stiffer filaments, allowing thicker application on tougher surfaces. 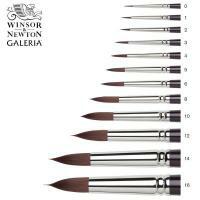 Galeria brushes are stiff enough to push thick colour, applying the colour like a spade for specific effects. 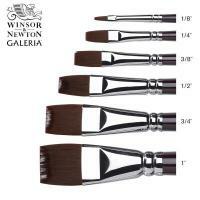 The short-handled variants have excellent colour carrying capacity for use with fluid colour. 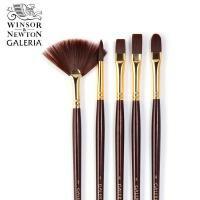 The synthetic filaments in the flats are curved, helping the brushes retain their original shape during use and the rounds offer a good point for delicate linear application. Regardless of the volumes of water used in acrylics, the use of synthetic fibres ensures good shape retention particularly in comparison to traditional hogs.